Signs like this one on Spring Hill Drive are missing from the school speed zone on Waverly Drive near South Albany High. As reported here, the 62-year-old southeast Albany resident went to trial in Municipal Court on Jan. 28, arguing that the 20 mph school zone was improper for two reasons: It was imposed without an engineering study justifying it, and it lacked signs showing where the school zone ends. Judge Robert T. Scott took the case under advisement to read up on the driver’s points. On Jan. 30, he wrote to Van Ras. Van Ras had appeared for trial by himself, without a lawyer, so Judge Scott was obligated to get his consent to consult the city attorney. In a Feb. 5 response to the judge, Van Ras pointed out that his trial notice from the court had said the city prosecutor would appear only if the defendant had a lawyer in court. Otherwise, the trial would be between the judge, the officer who issued the citation, and the driver who received it. Last year, Van Ras and another resident of the area, Diane Conrad, asked the council to remove or change the speed zone on the normally 40 mph road, arguing that the conditions there make it unnecessary. Van Ras also told the council about the lack of zone-ending signs and urged that instead of being in effect from 7 to 5 on school days, the zone be marked by flashing lights. Albany transportation analyst Ron Irish now has prepared an engineering study that will go before the city’s Traffic Safety Commission on Feb. 18. (A Feb. 4 meeting was rescheduled for lack of a quorum.) 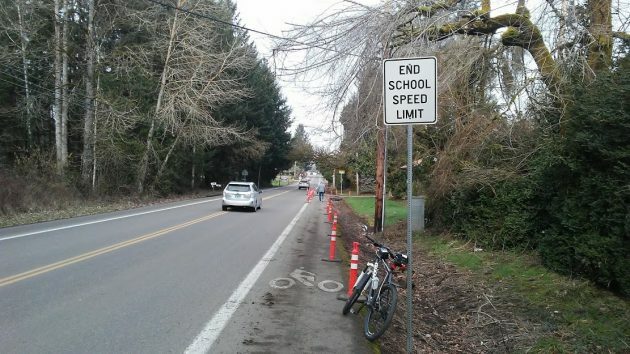 The study recommends that the school zone be shortened from the present 1,200 feet to 400 feet, but that it remain from 7 to 5 on school days. I kind of agree with Van Ras, signage is important, especially if you’re going to hold people accountable for breaking a law. Although I have never received a ticket on N. Albany Rd., I have never understood how you are suppose to determine when school is in session, especially when you don’t have children. Now school is out so much more than when most of us were growing up, you really don’t know when school is actually taking place. Many municipalities use the flashing lights, which seems reasonable, we have to try and figure out from looking at how many cars are in the parking lot. Maybe someone has a better idea to determine when school is in session, what are the indicators? Van Ras is simply trying to get out of a ticket and pretend that it is rocket science. I’m not sure what the question of “need” has to do with it. No one should be required to state a need for behaving lawfully, which it seems the defendant thought he was doing — driving 39 mph in an area that most of the time is a 40 mph zone. And even if he’s only trying to “get out of a ticket,” so what? That’s his right. Would you derisively state that someone was “simply trying” to exercise one constitutional right or another? I realize this is not a constitutional issue, but it’s wrong to bring in unrelated questions while criticizing someone for lawfully standing up for himself. Probably because you have taken exception to the proposals of others so many times. That is a good point…why do we have a 40 mph speed limit going through a residential neighborhood with school zones or for that matter residential neighborhoods period? In my case, I can understand Gibson Hill Rd. still being 40 and 45 because it has not yet been turned over to the city, even though it has the presence of a large number of bikes and pedestrians. But why is N. Albany Rd. still 40 mph, it is now under city jurisdiction? These are not farm roads any longer. You are correct Ray, why have the speeds not been reduced in residential neighborhoods? Especially when the city has the jurisdiction to reduce them. My only point is these are the current rules set by ODOT and the county/city, flow of traffic is 40 mph going down to a potential 20 mph, and you have to make a split decision whether to brake or not. It is easy to say, everyone needs to go 20 mph Monday through Friday, 7 to 5, all weeks of the year. You are making a recommendation, it is not the law and it is also a good way of getting run over from behind. It is reality v. an absolute ideal. If Van Ras gets out of a ticket because he points out a specific traffic issue within the city that relates to his case and needs to be resolved, I think that is fair. Your opinion on how fast one should be allowed to drive has no bearing on legality. Glad your not a judge, this is the same mentality as “he looks like a criminal, he must be guilty”. To Mr. Van Ras—great decision. Having The judge roll into the mix all to hype about the potential, created out of thin air, would compromise your case. Hang in there. I have no quarrel with the lower speed limits around elementary schools, but have often wondered why they’re used for high schools. These are young adults, not little children whom we must try to prevent from accidentally wandering into the street. I know this opinion isn’t relevant to Mr. Van Ras’ argument, but nevertheless I find it annoying whenever I drive south on Waverly past the high school. Thank you Hasso, for this marvelous forum. Van Ras’ complaint regarding that there is no signage indicating the end of the school speed zone (technicality) is enough to excuse his breaking the posted speed limit. The logic escapes even someone as dim as myself. This blatant disregard for a legal limit demonstrates specific intent on the part of Van Ras. He had no intention of abiding by the law – because there was no sign indicating an end to the safety speed zone. As we all know, intent is what sinks ships, technical or otherwise. Whatever happened to common sense? The school zone ends at the stop light. But a lack of engineering study or ending school zone sign doesn’t NOT negate the fact that he WAS speeding. End of story. Pay your fine and stop speeding.